Imagine spending a week in a diverse, creative community of youth and adults where no one puts you down. Rather, everyone supports you in taking creative risks you never thought possible. Perhaps you discover that you are a poet, a singer, a dynamic speaker… or that you have deep wells of empathy and care for the world. You learn all kinds of amazing things about yourself and others—and this knowledge propels you in the direction of accomplishing your biggest dreams. This is Power of Hope Camp: a gathering of 50 youth (14 to 18 years of age) from diverse backgrounds and life situations, and 25 adult staff and volunteers who are delighted to be with you—visual artists, musicians, actors, storytellers, dancers, naturalists, self-care specialists, community activists, change makers—all there to build a community in which everyone thrives. Good food, good friends, and good fun, in a relaxing, natural setting. And, yes, to have lots of fun! Our mission is to unleash the positive potential of youth through arts-centered intergenerational and multicultural learning programs that value self-awareness, leadership, community, and social change. Power of Hope Camp began with a single gathering in 1996 on Whidbey Island, 20 miles north of Seattle, Washington, US. Twenty years later, camps based on Power of Hope’s Creative Community Model exist in Canada, British Columbia First Nations, the US (Washington State, Oregon, and California), Jamaica, Brazil, South Africa, Uganda, the UK, and India. And the movement is growing! 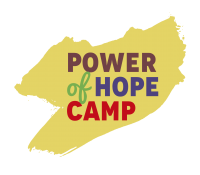 Power of Hope Camp is a program of Partners for Youth Empowerment (PYE Global), a registered 501(c)3 organization in the United States and a registered charity in the UK. PYE works worldwide to awaken the innate creativity of youth and develop confidence, and essential 21st century skills like collaboration, empowerment, motivation, and social and emotional literacy. Our programs are based on the Creative Empowerment Model (CCM), developed by PYE founders Charlie Murphy and Peggy Taylor. We operate on the premise that each of us, no matter what age, has a deep well of creativity and that we thrive when we are supported to take increasing levels of creative risks in safe environments. The Creative Empowerment Model provides practitioners with the know how to transform any gathering—whether a camp, classroom, youth program, community event, conference, even a working team—into a Creative Community that engages and inspires everyone involved.